Where are we on the Scenic Byway right now? We are staying in Yucca Valley, California, running around the area seeing the sites, visiting friends and showing the area to my parents. These shots were taken yesterday, the last day of December, on the land that Paul bought many years ago. We went there yesterday to show my parents. I can't believe it has been a year since I've been on this land, and almost as long for Paul. Last year he sold his cabin down here and we were busy settling into Salt Lake City, so we did not have time to get down here. That is going to change in 2011. We hope to be spending a lot more time here this year. The land is in California, near Pioneertown, Yucca Valley and Joshua Tree, not too far from Palm Springs. 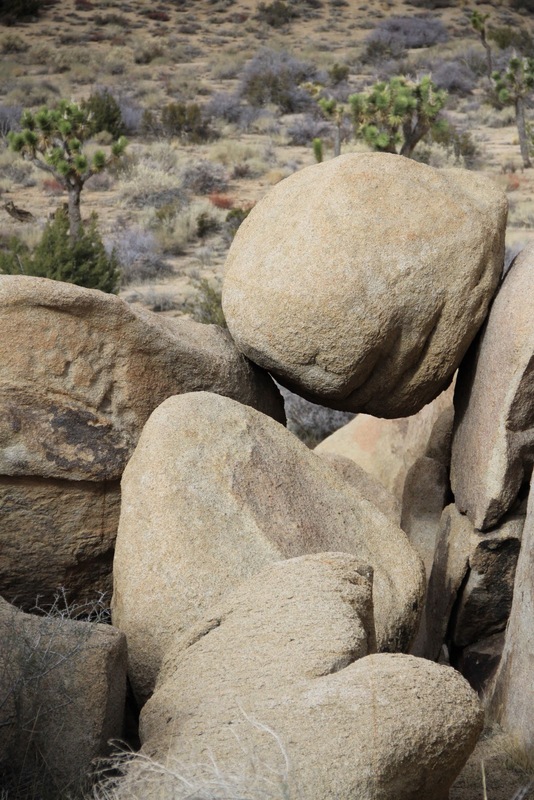 It is 40 acres of undeveloped, off grid land, full of boulders and desert plants. Real high desert landscape. Sand/dirt roads. There are homes out here - really cool ones - it is just that people own large chunks of land so the houses are far apart. I like that. A lot of privacy, a lot of space. When you are out there on the land you feel this space - it is beautiful. But what is so great is that you are only a 15 minute drive from downtown Yucca Valley, which has all the conveniences you need to live a "normal" life. And if you need even more stores and city life you have Palm Springs only 30 minutes away and Los Angeles about 2 hours away. We hope to start building here this new year - to fence the land, drill a water well and construct some kind of structure that we hope to grow and add to over time. Paul has had this land for a long time and has been thinking of plans to build a home here for many years. Now its only a matter of starting. Taking that first step. That plunge. Making final decisions of what we want to do and how we want to do it and how we will phase the steps to fit our budget. It is scary and exciting. I say scary because I feel it is always scary (but simultaneously exhilarating) to take big steps, decisions, risks with something, anything. Is there a better word than "scary" to describe that feeling? Being interested in renewable energy and energy efficiency I am super excited to put into practice all the cool things I've read about over the years about off grid construction and living. This year I plan to do a lot of research on these things. If any of you have ideas in these areas, send them my way. Me, the east coast city girl, never thought I would be spending time in the California desert and planning to build a home here. Wow. What a strange new world for me. Utah. California. The desert. But look at this crazy land! It is so beautiful in such a wild, unfamiliar way. In this new year I think a lot of My Scenic Byway will be here. Stay tuned. Hi Wendy - what a fun project! Best wishes building your dream home together. I hope you're able to do lots with it. One thing I'd love to do if I had all that space.. add a Dutchtub! H that Dutchtub is awesome!!!!! I want one! Thanks for the tip.